Check back for more details as this exciting event continues to draw international attention to the USA’s monumental efforts on Earth Day! Thank you for helping us reach our goal and keeping over one million pounds of electronics out of landfills in just 1 week, now imagine what we can do in 1 year!! 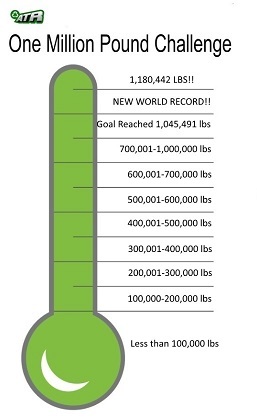 The official Guinness World record weight is 1, 180,442 Pounds and the equipment continues to come in. This epic task was used benchmark our operations and reporting capabilities and we’re happy to announce we passed with flying colors. In the months to come our management staff will analyze the data collected and use it to improve our infrastructure and increase our capabilities. Advanced Technology Recycling (ATR) is a full service ISO 14001 and R2 Certified electronic recycling company headquartered in Pontiac, Illinois. ATR is ITAR registered and compliant. Our commitment to our customers, partners and employees to protect our environment by offering the highest standards in ethics and safety and to focus on continual improvement in our reuse and recycling process establishes us as a pioneer in our industry. ATR has serviced communities and businesses nationwide for the past 10 years and has expanded its facilities to 5 different locations totaling over 260,000 square feet. These facilities operate and are registered under local, State and Federal guidelines regarding responsible recycling. Our motto, “We make electronic recycling easy!” is our way of saying that we understand your risk associated with improper handling of your end-of-life electronics. Our service and detail driven approach guarantees we will meet your needs and exceed your expectations. We understand how much time and effort it takes to acquire new customers and we work even harder to keep them.